Hallelujah, he found the ring! Third time is a charm, it seems. He didn’t even use the metal detector, just a plain old rake. Good news, since I wasn’t in the mood to scour the dirt again, in the rain, for the misplaced symbol of our eternal love and commitment. It was feeling very ominous! There’s no rhyme or reason to the string of things I’d like to post, so I’m just gonna go ahead and ramble like an idiot. Forgive me. First off, HOORAY for an old friend (and new sis-in-law) who understood the deep yearning I had for the Dover Victorian coloring book. I got it in the mail yesterday, and am totally breaking out the Crayolas this weekend. Thank you, Eilis. You always know how to please the kid in me! Now, on to less happy news. Teague lost his wedding ring last night while doing a get-the-dust-off-me” dance in the back lawn. 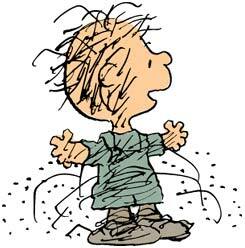 We’d been sanding drywall for the upteenth time, and he was starting to resemble Pigpen. While furiously shaking out his clothes, he thinks his ring must have flung off. We made every effort to find it, but given that it was pitch black and raining, conditions weren’t right for any type of treasure hunt. We’ll need a metal detector and a lot of luck if we’re going to find his ring. Cross your fingers for us. I don’t want to end on a low note, so here’s more good news… we’re done with the drywall sanding (except for a few small touch-ups) and the kitchen walls are primed. We used Behr Drywall Sealer, which kinda resembles Elmers glue. We got to take down the makeshift dust-stoppers (old sheets tacked to the ceiling/walls to keep the dust from taking over the whole house – which were pretty ineffective) and we’re planning to shop for floor tile tonight. Do you know how happy I’ll be the day we install something over our shiny white linoleum?? If you’ve ever had two dogs and a bright white floor, you’ll understand. Welcome to the club! You wouldn’t be a REAL renovator unless you lose at least one wedding ring! I lost mine too. Either in the basement while doing wiring or in the parking lot at Walmart. It would come off my finger in cold weather. Who knows, maybe it will turn up when I sweep the floor in the basement! My neighbour lost the diamond from her engagement band (it was tiny too), and she found it. She didn’t even know where she lost it either. So there is definitely hope, I’m sure you’ll find it. Hey Mindy! Hasn’t this weather just been the worst?! So uninspiring to get anything done. Ya know, I read your blog often and you two are just a couple of tanks over there…you are constantly getting projects DONE at your place! And it all looks so terrific! Ahhh…youth!